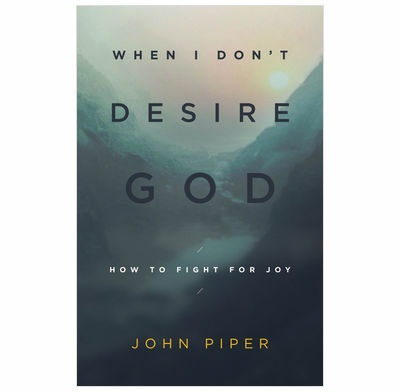 With a radical passion for Christ's glory, John Piper helps you find the joy God wants you to have. We all want to experience liberating, love-producing, risk-taking satisfaction in God. But the reality is that we often struggle to find, and hold onto, true and lasting joy—even when we have embraced the good news of God’s grace. So we face a crucial question: What should I do when I don’t desire God? This book is drenched in scripture and full of wisdom. Read it slowly. Read the Bible alongside it. Learn to ask God for more joy in Him, and learn to keep asking. Yes the book is repetitive, but we need to hear over and over God's command for His People to rejoice in Him. We are prone to wander, this book is brilliant for pointing to Jesus, who has the power to realign our heart. The first 5 and a half chapters were repetative and hard work, but it was worth it if you perservered. From chapter 6 and a half the pages were full of gems. The conclusion also needed a lot of work. This was a good book for my tired jaded heart. Piper's material is stirring and strong on scripture. As expected he desires us to be satisfied in God. I found him helpful on the link between emotions, the will and the body. He also encourages the reader in practical ways to meditate on Scripture. Although Piper addresses those whose joylessness has spiritual roots, he has a chapter for those whose darkness will not lift. I am very glad to have been pointed to this book.